Sheena Godfrey stands outside her home at the Concordia Place Apartments in Riverdale. When paramedics arrived, Jesse Bogan was still handcuffed to the wall, blood spurting from three gaping wounds in his left foot. A German Shepherd named Demon had bitten through his sneaker and held on to his foot for several minutes. Demon is a guard dog for A-Alert Security and Investigations, the private company hired to police Concordia Place Apartments, the subsidized housing complex on the Far South Side where Bogan grew up. About 30 minutes before paramedics arrived, Ricky Martinez, the owner of the security company, had stopped Bogan and his friend as they were driving out of the development, according to a written account by Bogan. “Get the f*** out of the car,” Martinez yelled three times after jumping out of a company SUV with his gun drawn. Soon, three more security guards arrived, pulled Bogan out of the passenger seat and took him to the security office, where they handcuffed him to a pole mounted on the wall. That’s when Martinez came back with Demon. The company said Bogan provoked the dog. But in a lawsuit, Bogan said the dog charged at him, urged on by Martinez and the other guards, who laughed as he was attacked. Afterward, Martinez and the guards left with the dog; Bogan, bleeding, called 911. The security company charged him with criminal trespassing. The charges were dropped when Martinez failed to appear in court. Residents of Concordia Place, a 297-unit federally subsidized housing development, say the June 2013 incident is just one example of a pattern of harassment and overzealous policing by Martinez and his private security company. 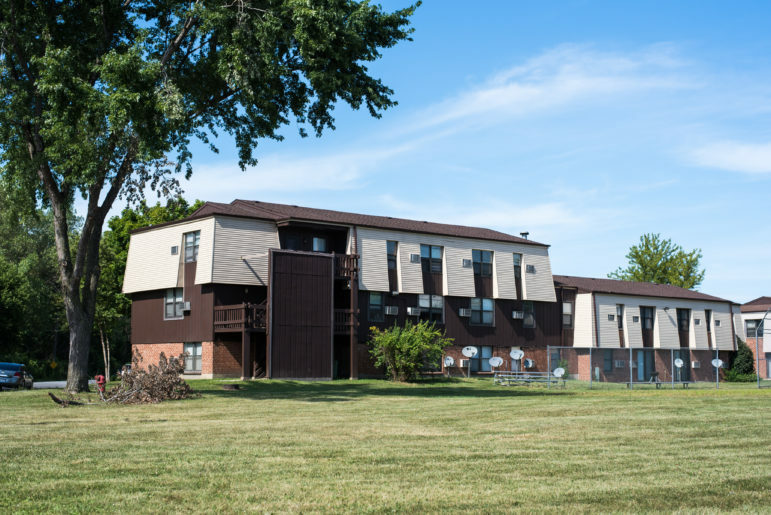 In April 2015, 26 African-American residents and guests filed a federal lawsuit against Martinez, A-Alert, and DRE, Inc., which owns both the property and the management company, Promex Midwest. Bogan, now 31, and another former resident filed separate lawsuits accusing Martinez, A-Alert and the other defendants of using excessive force and conducting illegal searches and seizures. They allege that A-Alert’s behavior amounts to racial discrimination and a violation of their civil rights. Despite the three pending lawsuits, Martinez and A-Alert continue to patrol Concordia Place with military-style assault rifles and a guard dog, supported by taxpayer money from the U.S. Department of Housing and Urban Development, which pays DRE, Inc. monthly rental subsidies of $3 million per year, according to Dennis Egidi, the president of the company. He said A-Alert is necessary to protect residents from gangs and drugs. Sarah Lampel, Promex’s director of operations and compliance, declined to comment, as did Martinez, through his lawyer. 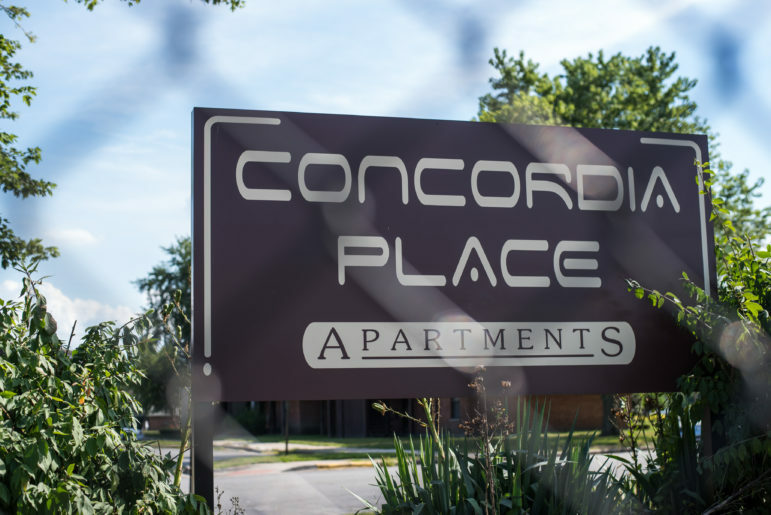 A HUD spokesman said the agency is conducting a management review of Concordia Place in response to complaints about A-Alert, but he wouldn’t provide details, citing the lawsuits. The situation raises concerns about the increasing use of private security companies to police public housing complexes across the city and whether HUD is lax in its oversight of the companies. They wear bullet proof vests and carry assault rifles, handguns and Tasers, which they aim at residents and visitors. They ban guests from the property without cause and, often, without informing them that they’ve been barred. When the guests return, they physically detain them and have them charged with criminal trespassing. As recently as Aug. 21, a dozen A-Alert security guards set up a checkpoint at Concordia Place and stopped every car they didn’t recognize to ask drivers for ID and the reason for their visit, even cars driven by residents. Many of the incidents take place at night or on weekends, when the on-site management office is closed and no one is there to hear complaints. A-Alert often refuses to investigate when residents inform the company about criminal activity. When residents complain to management about A-Alert, they say their concerns are ignored. Concordia Place is part of HUD’s Section 8 Housing Assistance Program, which subsidizes developments that rent to very low-income families. The subsidies are based on how much rent each tenant can afford but, unlike Housing Choice Vouchers, are tied to the development, not to individual tenants. If a resident moves, she loses her rental assistance. As a result, some tenants are hesitant to complain to management or join the lawsuit because they fear being evicted and left with nowhere to go, some residents say. The sign at the entrance of Concordia Place Apartments seen through a chain link fence. Housing experts and lawyers say the way the Section 8 system is set up makes it easy for management and owners to intimidate and ignore the concerns of low-income residents. “In subsidized properties, your voucher is very hard to come by and very easy to lose,” said Paul Burns, an organizer with the Metropolitan Tenants Organization who helped renters at Concordia Place form a tenants association in June. HUD has the power to withhold rent payments from property owners who don’t provide “decent, safe and sanitary housing,” but they rarely use it, housing experts say. Residents say they hope HUD acts quickly, because they are desperate for relief from Martinez and the other A-Alert security guards. At first glance, Concordia Place looks idyllic. A small road encircles more than two dozen two- and three-story brown and white apartment buildings. Sidewalks cut through manicured lawns between buildings like paths navigating through a college campus. It looks like an oasis in the industrial wasteland of Riverdale, Chicago’s poorest and most isolated community area, on the city’s southern edge. Across the street from Concordia sits the entrance to one of Chicago’s wastewater treatment facilities. Riverdale’s 7,000 residents have a median income of less than $14,000, according to the most recent Census data. In 2010, 45 percent of the area’s buildings were vacant, the highest rate in the city. “It’s a very difficult part of town,” said Egidi, who visits the property about twice a year. Before A-Alert was hired, the security cameras at Concordia Place were shot out, he said. “I’d be the first one in the world to have no security and save $275,000 a year,” he said. But current and former resident say Concordia Place has always been a relatively safe place to live. “Concordia has never been a violent place. Never,” said Sheena Godfrey, a resident for 13 years, who is 8 months pregnant. She said A-Alert has made it more dangerous to live there, not less. Last year, when an ex-boyfriend tried to break into her apartment while she was home, Godfrey called the security office for help; they told her to call the Chicago Police Department instead, she said. A-Alert officers also have been seen speeding their Blue Chevy Tahoe across the development’s grassy lawns, where children play, Godfrey and other residents say. Security officers hit her parked car in January 2014 while pursuing someone, Godfrey said. “They’ll pick and choose” which crimes to pursue, she said, often focusing on seemingly minor infractions. One night in March, Martinez mistook Godfrey’s cell phone flashlight for its video camera, which he thought she was using to film him and other A-Alert security guards as they searched another resident’s car. A management company rule prohibits tenants from photographing or filming security guards; a violation could result in eviction. Martinez threatened at the time to cite her for a lease violation, tow her brother’s Jeep and “ban each and every one” of her visitors and guests, she said. A few weeks later, Martinez seemed to make good on his promise. He barred from the property Godfrey’s boyfriend, who helps support her and her children and is the father of her unborn baby. Godfrey, a plaintiff in the tenant lawsuit, said it took her months to get a meeting with the property manager to find out why he was barred. The manager told Godfrey in July that her boyfriend was barred because he didn’t have a driver’s license and his car wasn’t registered, she said. Godfrey doesn’t understand why that should be a reason to ban someone from the property. 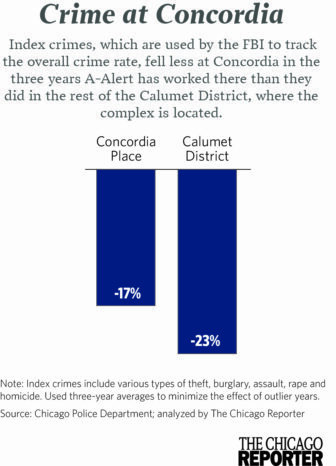 An analysis of crime data from the Chicago Police Department shows that “index crimes” like theft, assault, burglary and homicides have declined at Concordia Place since A-Alert started in October 2011, but not as much as they’ve gone down in the Calumet District overall, where Concordia Place is located. 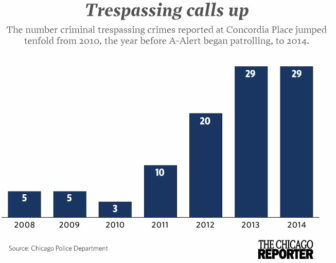 One crime is up sharply at Concordia Place since A-Alert was hired: Criminal trespassing complaints, many of them initiated by A-Alert, have skyrocketed at the property from three in 2010 to 29 in 2014. Banning residents’ loved ones or—worse—having them criminally charged, has had a profound impact on their lives. Godfrey, who doesn’t have a car, now relies on friends and family for transportation to doctor’s appointments, to pick up her kids from school and to go to the grocery store. She has missed several doctors’ appointments because she couldn’t find someone to give her a ride, she said. Some friends and family members say they avoid going to Concordia Place because of concerns about being harassed, barred or charged with trespassing. Seventy-five residents signed a petition last summer asking Promex Midwest, the complex’s management company, to fire A-Alert. They said they received no response. Incidents between A-Alert guards and residents can quickly dissolve into a game of he said-she said. In documents obtained by The Reporter, Martinez and Promex have painted residents as aggressors and instigators. Take one example from the Saturday before Easter. A resident had a party that, her neighbors say, was so quiet that other residents in the building didn’t even know it was going on. Most of the visitors were elderly family members. A-Alert guards saw an unusually large number of cars in the parking lot and tried to figure out where the gathering was, said Yolanda Walker, a neighbor. “The next thing we know, all of his guys start rushing up the stairs, dragging people, slamming people [into the bannisters],” said Walker, president of the tenant’s association. Sarah Lampel, director of operations and compliance for Promex Midwest, told an entirely different story in an email to Qwanchaize Edwards, director of legislative affairs and communications for 9th ward Ald. Anthony Beale, who had reached out to management on behalf of the tenants. “As you receive calls from residents, please keep in mind you are receiving only half of a story,” she told Edwards. Martinez’s accounts of such incidents sometimes shift. His version of what happened on a crisp night in May 2014 changed several times, according to court records. What is indisputable is that Martinez and another guard saw two teenagers walking on Concordia Place grounds. When the teens saw security coming, they ran. Martinez and his partner chased after Denon Oglesby, a 19-year-old Concordia resident, in their SUV, before catching him and handcuffing him. According to the police report, Martinez told CPD officers that he saw Oglesby look in his direction and then run, holding his side as if he had a weapon, and then drop a gun on the ground. Martinez’s written report, which A-Alert guards are required to make of every incident, made no mention of the teenager holding his side, according to court testimony. But when he testified at Oglesby’s trial, he said the teenager threw something against the wall of a building, which made a loud sound like metal hitting brick. At the time he couldn’t see what the object was, he said. Oglesby was charged with six counts of aggravated unlawful use of a weapon, a felony. After hearing Martinez’s testimony, a Cook County judge found Oglesby not guilty on all six counts based on his conclusion that the prosecution presented insufficient evidence. A view of Concordia Place Apartments in Riverdale. Martinez is at the center of most disputes involving A-Alert. He dreamed of becoming a police officer since he was a teenager. Soon after he came to the United States at age 17 from his native Morocco in 1988, he began working toward that goal. (He changed his name from Zouheir Rahmani when he became a U.S. citizen in 2001.) Starting around 1994, he applied at least eight times to at least five different police departments, including Houston, Los Angeles, Bridgeview and Chicago. He applied three times to the Chicago Police Department between 1999 and 2006. He was rejected based on several marks on his record, including his 1991 arrest for aggravated assault for allegedly trying to hit a traffic aide with his taxi. He was sentenced to court supervision. He sued the department, alleging that he was discriminated against because he is Muslim and Arab. A federal judge ruled in favor of CPD after finding that Martinez failed to present evidence of discrimination. In March 2003, Martinez began work as a part-time security guard and supervisor for A-Alert II Security-N-Guard Services, according to his CPD application. One of his supervisory responsibilities was to ensure compliance with the requirements of the Illinois Department of Financial and Professional Regulation. But he didn’t receive his state license or firearm training until 2005, according to state records. In January 2004, A-Alert was placed on probation and fined $750 by IDFPR for employing nine people who did not have active state licenses, including one person who had never applied for one. The problem is that Martinez didn’t receive his state private security contractor license, which permits a licensed security guard with at least three years of experience to run a security guard agency, until April 2012, state records show. Moreover, A-Alert Security Services, which also goes by the name A-Alert Security and Investigations, wasn’t licensed as its own private security agency until May 2012. State regulation of the private security industry is minimal. A licensed armed security guard in Illinois has to submit to a background check and go through just 40 hours of training: 20 hours of basic instruction and 20 hours of firearms training. The basic instruction includes information on use of force, arrest techniques, civil and criminal laws for private security guards and fire prevention. The ranks of private security companies are growing rapidly. According to the Bureau of Labor Statistics, there were nearly 980,000 private security guards in the U.S. in 2014, or about three private guards for every two federal, state and local law enforcement officers. One area ripe for private security is public and subsidized housing, Nemeth said. The Chicago Housing Authority Police Department was disbanded in 1999. Most public and subsidized housing developments in Chicago now have private security companies, and many of them have serious problems, according to housing advocates. 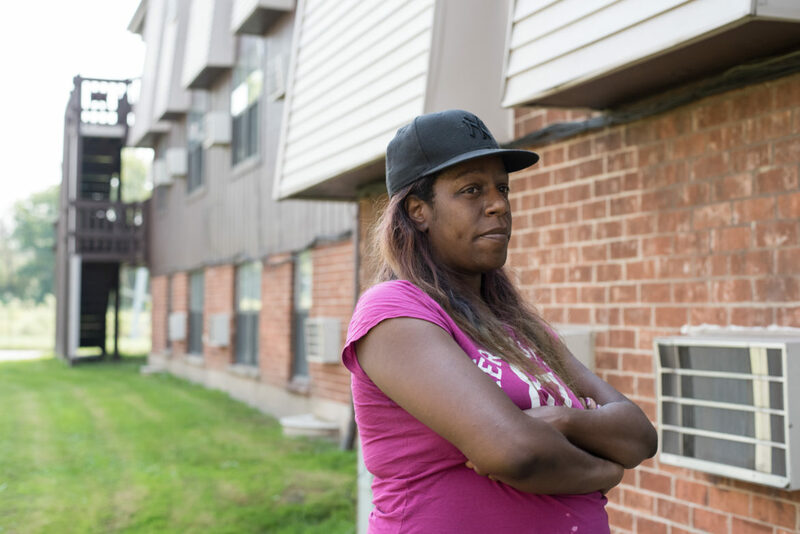 Most of the complaints she hears from tenants at subsidized housing developments are that security is too lax and ineffective. One of the problems, experts say, is that the U.S. Department of Housing and Urban Development doesn’t monitor subcontractors at developments where they subsidize rents. HUD did not respond to questions about the amount of the contract at Concordia Place. HUD’s Real Estate Assessment Center conducts inspections of properties every three years, or more regularly if problems are found. Inspectors look only at physical issues like plumbing, insects and garbage disposal. They don’t evaluate security companies or their practices. Residents say Martinez and his company have turned Concordia Place into a de-facto prison. “I feel like a target, an inmate,” Godfrey said. These days, she rarely stays at Concordia Place. She and her kids have been staying with her boyfriend or with relatives, sometimes sleeping on a couch or the floor. Are you or someone you know experiencing problems with a security company at a local public housing complex? If so, contact reporter Jonah Newman at jnewman@chicagoreporter.com. Mark Diamond has been the subject of mortgage-related lawsuits for decades, as a Reporter investigation revealed earlier this year. Why would you compare crime at a complex in Riverdale, a suburb, to a police district in the city of Chicago? Riverdale is not in the Calumet District, as you claimed, it’s in Riverdale. Neither Riverdale nor Concordia Place are in the city of Chicago. Thanks for reading, Jerry! Concordia Place is located in the Riverdale neighborhood of Chicago, which is in the Calumet Police District. There is also a suburb called Riverdale, which is adjacent to the Chicago community area of the same name. Not surprising at all with the discrimination thing and Land lords selling their section 8 houses to those who doesn’t like to participate in this program. Its simply telling you guys to get out of the place. Years ago I lived in section 8 housing and honestly, I would pray to have had a security company like this one. I fell on hard times and no choice but to get assistance from the government. The security I’ve dealt with stole from the residents, slept around with the residents, and committed criminal acts with the residents. A majority of people living in section 8 housing are use to doing what they want to without following the rules or having anyone around to tell them what to do. While I don’t live on this property or know anything about it, It sounds to me like the resident are upset because they cannot do what they want do. I worked hard to get out of section. I’m not saying everyone receiving assistance is bad but look at the majority in these housing developments. It seems AASI is doing a better job than any other company that I’m use to encountering during my previous living arrangements and experience with being a resident of housing complexes. I don’t know why people think black low income people not scared of the same thing that they are like they like violent if AASI was over there doing there job no one will saying all those things about them. I been around cp for years and it always been a good place so don’t lat AASI tell you they did that let them tell you how they bared young men that been out there they hold life from there so they had to go to other neighborhoods and got killed by people from that neighborhood let them tell you how they disrespect the black lady that’s on section 8 take there kidds father’s always from them tell them if they get off section 8 they can see them again. It never been a security lighting in cp for somebody to shoot out stop the lies and look at the facts and HELP those people in Concordia Place Apartments. Thank god for giving us justice but 60 days is a long time becaurse security out here harassing us more then ever since they have to get up out concordia now how can we get protecetion from MARTINEZ ALERT SECURITY THAT KEEP HARASSING US. All I can said is keep your phones on you at all time and Video Record Security to Protect yourself!!!! Just knowledge for the brain to protect!!! I posted this comment, with pictures, last night but i guess someone from the magazine took it down. Not a very impartial coverage i see !!! Mr. McCaskill is the son of the president of Concordia Place Apartments tenant association, Yolanda Walker. I guess AASI harassed him too much at Concordia so he couldnt rob people at Concordia. he traveled up north to practice his good deeds. I wonder what Ms Walker has to say about this incident. It’s a big difference from securing the property from criminals and harassing residents to make it seem like its crime out here AAlert has to find something to do to make them seem relevant and needed I guess riding on the grass in their trucks like their playing on atv’s is getting boring. Look how Martinez Security guard let the dog ate up one of the resident feet Jay move out of Concordia he was tired being Harassed by Martinez Security. Sadly, many do take into consideration the residents who enjoy the safety that the current security company is providing and are terrified at the prospect that there may be no security or that the new company may not be as vigilant as A-Alert. Here is a notice that was distributed around the property, asking for help to save security. Sadly, many do not take into consideration the residents who enjoy the safety that the current security company is providing and are terrified at the prospect that there may be no security or that the new company may not be as vigilant as A-Alert. Here is a notice that was distributed around the property, asking for help to save security. Good, more police and private contractors are needed to keep these wild black folk under control. They only recognize raw force and have no dignity nor respect.